↑ Bharati Ray (1 September 2009). Different Types of History. Pearson Education India. পৃষ্ঠা. 95–. ISBN 978-81-317-1818-6. http://books.google.com/books?id=9x5FX2RROZgC&pg=PA95। আহৰণ কৰা হৈছে: 24 June 2012. ↑ B. S. Yadav (28 October 2010). Ancient Indian Leaps Into Mathematics. Springer. পৃষ্ঠা. 88–. ISBN 978-0-8176-4694-3. http://books.google.com/books?id=nwrw0Lv1vXIC&pg=PA88। আহৰণ কৰা হৈছে: 24 June 2012. ↑ 3.0 3.1 3.2 K. V. Sarma (2001). "Āryabhaṭa: His name, time and provenance". Indian Journal of History of Science খণ্ড 36 (4): 105–115. http://www.new.dli.ernet.in/rawdataupload/upload/insa/INSA_1/20005b67_105.pdf. ↑ Ansari, S.M.R. (March 1977). "Aryabhata I, His Life and His Contributions". Bulletin of the Astronomical Society of India খণ্ড 5 (1): 10–18. http://prints.iiap.res.in/handle/2248/502। আহৰণ কৰা হৈছে: 2011-01-22. ↑ Cooke (1997). "The Mathematics of the Hindus". পৃষ্ঠা. 204. 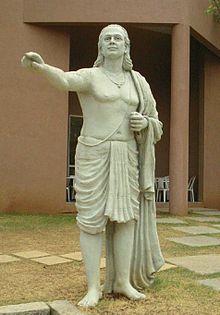 "Aryabhata himself (one of at least two mathematicians bearing that name) lived in the late 5th and the early 6th centuries at Kusumapura (Pataliutra, a village near the city of Patna) and wrote a book called Aryabhatiya." অ’ কন্নৰ, জন যে. ; ৰবাৰ্টছন, এডমাণ্ট এফ, "আৰ্যভট্ট", মেকটিউটৰ হিষ্ট্ৰী অৱ মেথমেটিকছ আৰ্কাইভ, ইউনিভাৰ্ছিটি অৱ ছেইণ্ট এনড্ৰিউছ, http://www-history.mcs.st-andrews.ac.uk/Biographies/আৰ্যভট্ট_১.html .